Where are my Lab Bucks? We didn’t forget your Lab Bucks…we’re going electronic! Another Green Initiative from Weber Scientific! Effective March 21, 2016 we’re replacing the paper Lab Bucks with a new electronic Frequent Buyer Program. This will be easier for you and will help us move towards our sustainability vision. Click on the “frequentbuyers.weberscientific.com” link located at the bottom of the home page. Click on the “Continue to Login/Registration page” button. Create your login information (email address and password of your choice). Please note that this program is designed for one user per company location. Under the “Registration” section, you must include your Weber Scientific customer number and ship-to number as this is how your Lab Bucks are calculated from your account. Please contact our customer service department at the number below if you need this information. Your available Lab Buck points will be shown in the upper right corner. As purchases are made and items redeemed, your available points will adjust accordingly. Add your selected items to the shopping cart and check out. You can choose whatever ship-to address you want, whether business or residential, however, residential addresses will not be saved in this system. If mailed in with a request to load the Lab Buck points into your electronic point bank. Your order will then be processed for shipment within 2 to 8 weeks or sooner, if your selection(s) are available. Note that no shipment records are maintained on this Frequent Buyer website once completed. This program has been specifically designed as a way for us to express our continued gratitude to our many loyal customers – again and again. You’ll receive Electronic Frequent Buyers coupons – called Lab Bucks – with every purchase of $50.00 or more from Weber Scientific. Collect enough points to get these terrific FREE gifts. It’s easy to redeem your Lab Bucks. Simply follow the simple instructions on the printable order form. If you have any questions about our Frequent Buyers Program, please call 800-328-8378. All orders of $50.00 or more entitles you to receive Lab Bucks. Lab Bucks are given based on the total value of the order and will be packed with your shipment. 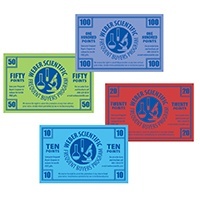 For every $50.00 in purchases, you will receive 10 Lab Bucks. *Minimum order is $10.00, eligibility in program begins with orders of $50.00 or more. NOTE: Allow two to eight weeks for receipt of your free gift(s). In the event of a model change or discontinued product, you will be offered the choice of a new model or another selection having the same point value. Weber Scientific is absolutely not responsible for lost, stolen or mutilated coupons under any circumstance. Nor is Weber Scientific responsible for lost mail. You may want to consider mailing coupons by certified mail. Offer good only in U.S.A. We reserve the right to cancel this promotion at any time without prior notice. Invalid where prohibited by law or institutional policy. To use up your paper Lab Bucks you may want to download Weber Scientific’s Frequent Buyers Program Catalog and the printable Order Form. Please feel free to contact us with any questions or concerns at 800-328-8378.